Many volcanoes are inactive for long periods of time, during which populations settle on their slopes. The pyroclastic material from a volcanic eruption can destroy a village, cover it totally with ashes (as was the case in Montserrat—read about the health conditions in this Caribbean island), or with flows of volcanic mud—“lahars”—as in the case of the Nevado del Ruiz volcano in Colombia. 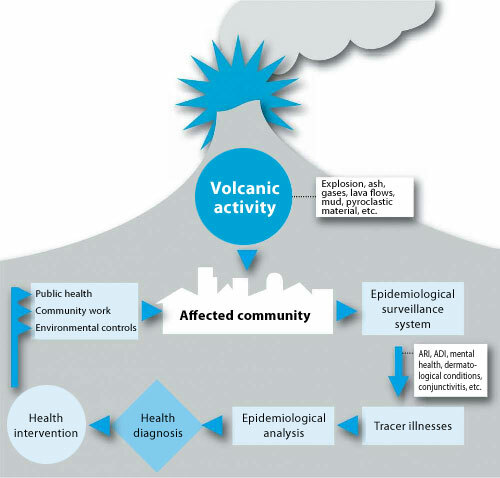 Although risks vary with the events, the health effects of volcanic eruptions can include fatalities, trauma, burns, asphyxiation, dermatological diseases, conjunctivitis, and ocular and respiratory diseases. Where ash falls, there is a risk of water and food being contaminated, and a risk of increased respiratory disease, since basic services (water, transportation, communications, etc.) can be compromised. Moreover, ash accumulation on fragile roofs can damage buildings or cause their collapse. Damage to health services infrastructure and to water and sanitation systems can be severe. Health facilities in areas at risk from volcanic activity can be completely destroyed or have their functioning impeded by the ash. Air and water quality monitoring is a public health measure of vital importance in cases of volcanic activity.